An Ethiopian Airlines 737-800 freighter. Ethiopian Airlines, on 1 March took delivery of its first Boeing 737-800 freighter, the first of its kind in the Ethiopian Cargo fleet mix. 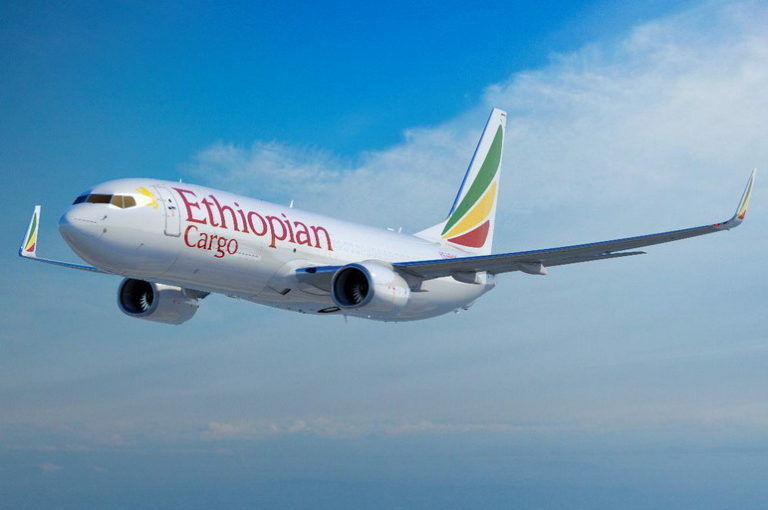 Group CEO of Ethiopian Airlines, Tewolde GebreMariam, remarked: “We are excited to have taken delivery of the newest freighter a few days after being crowned with ‘African Cargo Airline of the Year’ and ‘Air Cargo Brand of the Year in Africa’ Awards for the fourth year in a row. The freighter has a carrying capacity of more than 23 metric tons of payload. In January 2018 Ethiopian Airlines committed to lease two 737-800 freighters converted by Aeronautical Engineers Inc from GE Capital Aviation Services (GECAS). The first was expected in June 2018 and the second in January 2019. By 2025, Ethiopian Cargo & Logistics Services envisions becoming a full-fledged profit centre of Ethiopian Airlines Group with annual revenue of $2 billion, 19 dedicated aircraft, annual tonnage of 820 000, and 57 international destinations.